This grantee was part of the Center’s Shared Services Learning Community. 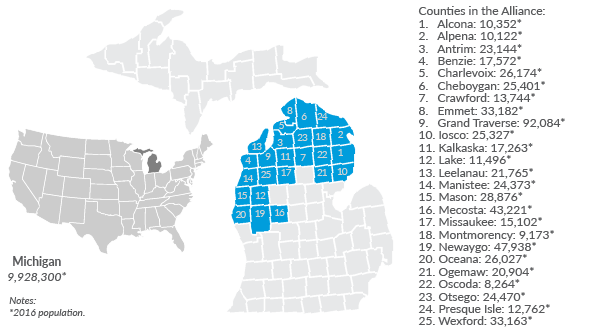 The Northern Michigan Public Health Alliance, comprising 25 rural counties served by six local health departments, was established to facilitate CJS across the region. The alliance was formed through a memorandum of understanding (MOU) signed by the chairs of the six boards of health. It is guided by a steering committee that consists of the four health officers representing six health departments. During the time it was part of the Center’s Shared Services Learning Community, the alliance prepared county-specific inventories of current capacity and an inventory of current CJS arrangements; analyzed different CJS models and identified those seen as most feasible for the region; developed a CJS strategic plan that included goals for each department as well as identification of common goals across the region; and prepared a feasibility study examining the potential for multi-jurisdictional accreditation. The alliance also established partnerships with the health care organizations that serve the region. Summary report: This report was published in 2015 and provides a summary of the site’s activities during the time it was a demonstration site for the Center. Site visit report: The Center visited the site in October 2014. This report documents the activities from the site visit as well as some of the Center’s observations. Project Description: The site produced this report to describe its work. To learn more about the public health system and cross-jurisdictional sharing in Michigan, and to find examples of other CJS arrangements there, visit the Center’s state page about Michigan. For more information about this site, read about its activities as part of the Center’s Implementation and Impact Measurement Program.